New Forest Holistic Well-Being Therapist & Channel of Higher Energies. Hampshire based holistic well-being therapist, Tony Mills is a channel of Higher Energies. How Can Tony Help Me? Internationally renowned, Hampshire based holistic well-being therapist, Tony Mills has helped hundreds of people with a vast range of issues, from emotional to physical. People have met with Tony to assist with their feeling of being ‘stuck’ in life and feeling that they are not moving forward. Tony has also helped many to recover from debilitating illnesses. With his thirst for knowledge of holistic well-being, and his passion for understanding how to help people regain health and happiness, Tony has dedicated more than 30 years of his life to the path of being an excellent therapist. Tony lives in the New Forest, Hampshire and has two clinics and an online virtual meeting room option for those who live too far away to travel to see him in person. He is a former osteopath who realised that manipulation was not always the answer. This led him on a path of discovery of his own unique healing talents, and the development of one of the most powerful holistic well-being devices around today. This device is the Living Lens, a transformational rebalancing and harmonising tool, that has helped hundreds of people gain better health and well-being. 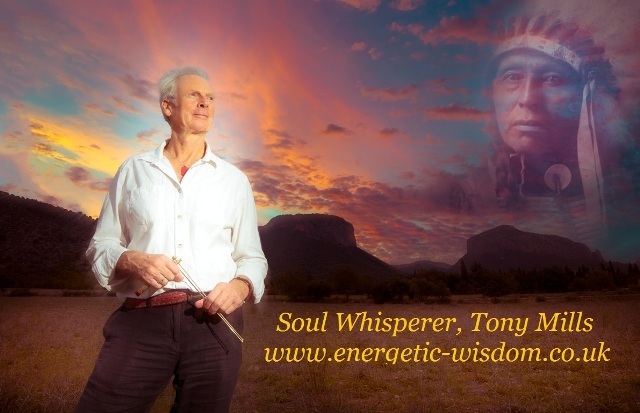 As well as being a holistic well-being therapist of over 30 years, Tony is also a channel of Spirit Guides, and with his kind manner and fun-loving nature, working with him can be both enjoyable and emotionally profound. Clear energy blockages in the bodies systems. Balance other energy systems of the body and layers of the aura. Harmonising imbalances, or negative karma, carried over from past lives. Safely remove Discordant energies or energy attachments. Member of the British Society of Dowsers. And has many years of experience with a diverse spectrum of clients. Internationally renowned, Hampshire based holistic well-being therapist, Tony Mills, created Energetic Wisdom, which is a holistic system for balancing, healing and harmonising all aspects of a person – body, mind, emotions and spirit. Born and raised in north Wales, and now living in Milford on Sea, in the New Forest, Hampshire, Tony Mills began working as a holistic well-being therapist over 30 years ago. Tony teaches that good health and well-being are a result of our positive emotions. On the contrary, when negative thoughts and emotions are repressed, often due to them being too painful or overwhelming, they do not simply go away. Our body, thinking it is trying to help, converts the emotional feeling of the issue we are experiencing, into crystallised negative energy and stores it in a certain part of the system, for addressing at a later date. Thoughts and emotions are energy and all have the power to impact our lives in a positive or negative way. It is the repression and denial of negative, painful emotions that lead to physical dis-ease and dis-comfort. This is the way the body reminds us that we still need to address the problem. Called the Soul Whisperer, by many clients, Hampshire based holistic well-being therapist Tony Mills has developed his own unique and efficient ways to detect and clear imbalances from the system. Tony has helped hundreds of people, just like you, to enjoy a return to health and well-being. Tony can help with most issues, from emotional to physical and even imprints from past lives as well as inherited diseases. Experiencing Energetic Wisdom for yourself is a unique experience which you will find both fascinating and positively life-changing. An opportunity to experience better physical health. A deeper sense of well-being and inner peace. The opportunity to transform and live the life you desire. With his many years of knowledge working with various holistic modalities, internationally renowned, Hampshire based holistic well-being therapist, Tony Mills, has devised unique methods to harmonise the mind, body, emotional and spiritual aspects of our health, without the need for physical manipulation or psycho-analysing. Appointments are offered in two clinics in the New Forest, as well as by internet using Skype or Zoom. Tony also helps children and this is usually done by distance healing. Not quite ready to book? Do you have questions? Book a Free clarity call.